Spot a breathtaking pink sunset and stay within walking distance of the water at our contemporary hotel near Stearns Wharf in Santa Barbara. Tour California’s oldest working wharf and one of the city’s most iconic landmarks. The wharf is the perfect place to pelican watch, take a water taxi ride, or stroll along the sparkling waters. 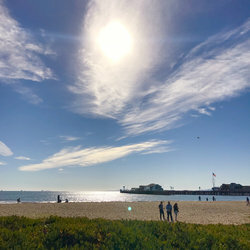 After a day seaside, rinse the day away in one of our micro guest rooms at our hotel near Stearns Wharf in Santa Barbara. Free parking is available for 90 minutes, but with limited spots. Walk 7 minutes from our hotel instead! Wheelchairs can be rented through Easy Lift. Be careful with strollers and high heels on worn planks. Enjoy the California sunshine and explore the weathered boardwalk. Walk along the wharf to explore a variety of specialty shops with ice cream, shells, and souvenirs. 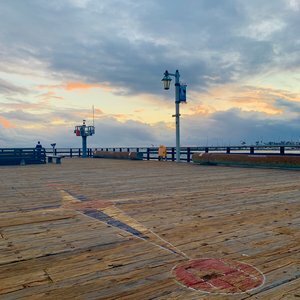 See some of our favorite restaurants nearby after exploring Stearns Wharf! Enjoy a glass of wine with one of the best views in Santa Barbara and touch starfish and sharks at the Santa Barbara Natural History Museum Sea Center touch tanks. 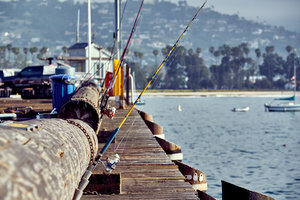 Try fishing at the end of the pier, with rods and bait available for rental by the hour. Discover marine life at the Santa Barbara Museum of Natural History Sea Center or see it for yourself on a whale watching tour! Tours are held in the Santa Barbara channel from late March to mid-July along the coastline. Spot dolphins, gray whales, and sea lions aboard the Condor Express or Sunset Kidd tour boats. Prefer to lounge on the beach? Rent an umbrella to relax by the rolling waves. 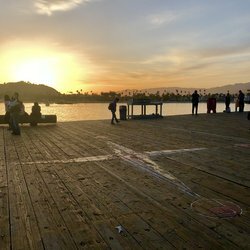 Stearns Wharf is perfect for exploring, people-watching, and soaking up some rays. The beach offers sand volleyball courts, a skate park, and paddleboard and kayak rentals. 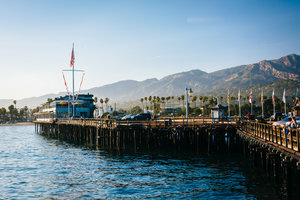 Book your stay today at our pet-friendly hotel near Stearns Wharf in Santa Barbara, California and stay within a seven minute walk to the pier!